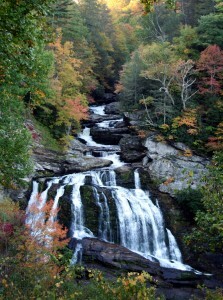 At the southern tip of the Blue Ridge Mountains, at an elevation of over 4,000 feet, lies the mountain community of Highlands, North Carolina. Surrounded by National Forest, with its rich history, cool summer temperatures and enviable way of life, Highlands has been a haven for Southerners for well over 100 years….an escape from the hustle and bustle of daily life. 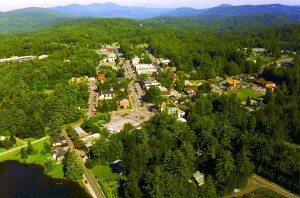 While the year-round population is 958 in the Highlands Town limits and 3,000 in the general area, in the summer it increases to over 20,000. Unlike most resort towns, the majority of summer visitors are also homeowners, creating a community of concerned citizens and cultural organizations with many diverse activities. Rarely is it possible for such a small town to offer the array of services found in Highlands. Medical needs are met with a full-service hospital and a staff of general practitioners, surgeons and specialists. The Highlands Civic Center provides a gym, tennis courts, pool, fitness center and meeting rooms with programs for all ages. The cultural amenities include professional theatre, chamber music, concerts, cabarets, art exhibits, visual arts, education classes and workshops, lectures, seminars and other special events. Within the five blocks of Main Street and adjacent streets that make up the center of town, Highlands is a charming blend of country and city cultures. You will find that art galleries, specialty boutiques and fine jewelry shops are not out of place next to local handicraft and quilt shops. There are over 20 restaurants from quaint café’s to Fine restaurants have been written up in Gourmet Magazine and Southern Living. Accommodations include luxury hotels, historic inns, genteel bed and breakfasts, rustic cabins, quaint cottages and elegant estates. With the rare combination of scenic beauty and ideal climate, Highlands has much to offer in the way of sightseeing and outdoor recreation.There are panoramic mountain views, waterfalls, lakes, streams, rolling hills, pasture land or simply the beauty of a wooded forest. Among the many outdoor activities include golf, tennis, nature tours, hiking, fishing whitewater rafting, repelling and snow skiing. 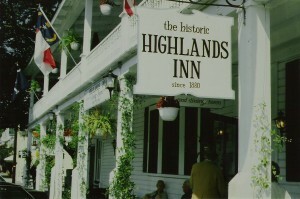 Perhaps the greatest natural asset to be found in Highlands is the warm and welcoming spirit of its people. Signature Properties wants to extend that warm and welcoming hand to you. We will be happy to assist you in recommending accommodations and restaurants. Our Rental Department is here to help you locate the perfect mountain getaway. And when the time is right, we would appreciate the opportunity to help you find that special place of your own.